I'm participating in the YMI Fall OOTD Fall campaign. Follow me on social media to see where my YMI OOTD takes me and more ways to style their pieces! Nothing like a raglan tee to create a classic and casual look. Everyday of my life is not going to be all glammed up in heels, so this look, minus the cross body and plus a tote is definitely something I would wear in an everyday setting. I'm a student, so function is important, but as a fashion blogger, I obviously want to incorporate style into my look as well. This raglan tee is really easy to style because of the simplicity. It looks great with just about anything! A big reason that I love YMI products is that they are the simple base that can be altered based on varying style types. For example, I prefer more classic and linear clothing, so I always try to create a nice streamline to any look. I built on the raglan base by adding some accessories including an express bag and target hat. The quilting on the bag and gold braided detail of the hat reminds me of fall, so it fit perfectly with this campaign. Both pieces made the look more interesting and complemented the top. A piece of advice: when shopping, look for pieces that you can build around in different ways. They last longer this way! Black jeans and booties are always a staple. 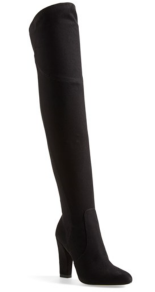 The boots are especially helpful when you're in a rush because they help to amp up any look. They make the most casual outfits look like the effort was there! If I was to do this look over again, I would swap out the jeans for a 70's style skirt to make this look truly retro. I would likely keep the accessories and swap the shoes out for some suede fitted over the knee boots! Click a picture for where to buy the item!